Mr. Craig provides professional seminars on coparenting issues, high conflict families, tools in working with families raising children between two homes, parenting coordination, and forensic vs. therapeutic best practices to organizations and professionals by request. His seminars range from 2 hour lectures to 2 day training sessions, depending on the organization’s needs and time available. His fee is $1000.00 for the day or part thereof, plus transportation and lodging costs for locations outside of the North Texas area. Please contact us to make arrangements for your group. Looking at the power of language. Love the examples of questions to ask parents, etc. All the examples that were given, PowerPoint excellent, can’t wait to read the book. It was a great refresher and I learned new terms; that was extremely helpful! The videos were interesting. The PowerPoint was also very good. The training was informative and animated. I really enjoyed Bradley. Bradley was very entertaining! Very informative! Great information on our code and how to protect our license. Great information regarding court involvement. Excellent information on language and how we unwittingly set up adversarial relationships. I had little information on this topic previously, so I wasn't sure what to expect. Extremely helpful and informative. 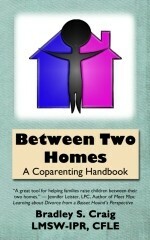 I really enjoyed this training, I learned a lot of information about coparenting. This class over exceeded my expectation. Learned how to work with children growing up between two homes. The course exceeded expectations by giving a whole view of working with these families. Great information. I learned greater awareness of strength based language and being more mindful of involving both parents.